Ready to sell your house? 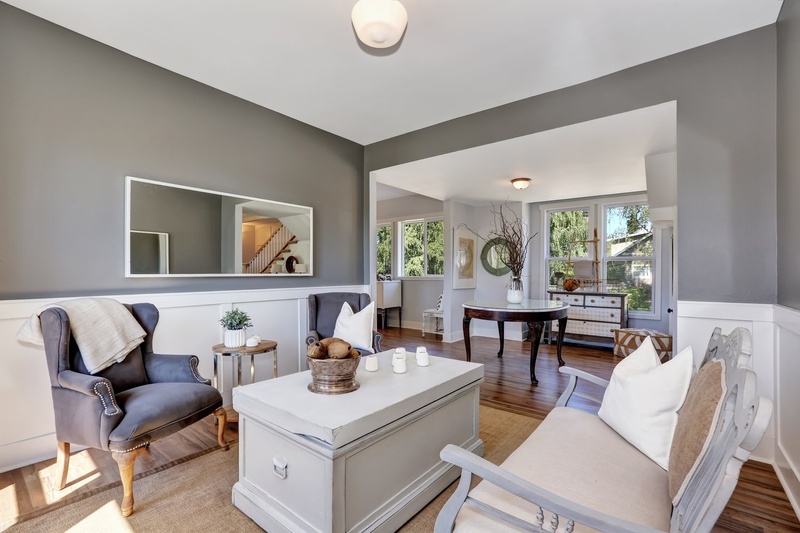 Here are a few staging tips to get your home prepared for the market. When listing a home that costs hundreds of thousands of dollars, if not millions, you want to make sure it is presented in the best light. You wouldn't buy a $50,000 car if it was filled from top to bottom with someone else’s personal content and trash. This is the same mindset you need to carry into selling your home that will be worth well over $100,000. The best thing you can do for your home for sale is to get rid of all of your clutter! Make a rule for your home that for every new piece that comes in, one must go. One of the biggest factors to a cluttered home is too much furniture. Generally, in a professional staging, half the homeowner's furniture is removed to make the house look bigger. Look around your house and see what you can pack away. It'll be worth the investment to get a storage unit for a few months to store away those extra furnishings and goods. There is a large misconception that furniture pushed directly up against the walls make a room look bigger, but this is far from true. Instead, you'll want to float your furniture in each room and away from the walls. Position your sofas and chairs into cozy conversational groupings. Be sure the furnishings are placed to make the traffic flow in a room obvious. This will make the room more user-friendly and will make it look larger. If you have a room that has only served to collect boxes or other junk, it is important to purpose the room to something that is functional. You can make it into an extra bedroom, a small cozy nook/reading room, etc. If the basement is your problem room, organize your boxes or move them to a storage unit and turn it into a gaming room or family area. The simple trick to toning down dated finishing in any space is a little bit of fresh paint. You don't want to go stark white, but look into neutral grey and beige colors. Beige colors can also consist of warm honey-like colors, soft blues and greens, and a variety of undertones that add a little life to a neutral color. If you do want to use bold colors, be sure to only keep it on accent walls to help enhance structural features. If you want to make a room appear bigger than it is, paint the room the same color as an adjacent room. For small kitchens and dining rooms, a seamless look will make the space feel like one, open it up, and make it seem much larger. Using drapes that match the wall colors can also add an emphasis to the room's size. Staged homes tend to use fresh flowers and pricey floral arrangements. If you don't have the money to go all out on florals, you can get this same affect by raiding your garden space. You can DIY beautiful pieces with fern fronds, magnolia clippings, and more. Use the spring and summer months to find cheerful flowers and use them in your arrangements. So you can't afford new cabinets? You can just get new doors and drawer fronts. Paint everything to match and add new hardware to them. Instead of replacing the entire dishwasher, you may be able to get a new front panel, and you should go for stainless steel if you think you can pull it off. Check with the manufacturer to see if replacements are available for your model. Unfinished home projects can really scare off potential home buyers, so you'll want to be sure to make required repairs. Missing floorboards and large cracks in the sidewalk on the way to your door tend to be a red flag. Holes in walls and scratched up door frames can really look unattractive. These repairs cost you less to fix than buyers might deduct from the asking price. Aside from de-cluttering, the most important step to staging your home is to clean it. A dirty house is a quick turn-off for potential buyers. Most homes, especially with children and pets or smokers, have a smell that may go undetected to home owners, but are quickly picked up by strangers. Be sure to have your home professionally cleaned prior to staging to show all buyers that your home is nice and fresh.